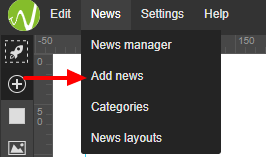 In website builder WebWave, the newsfeed element can be made of text and image. 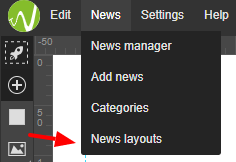 Text can be typed in special elements, which are part of every newsfeed template by default. To place photos on a newsfeed, you need to add to a template a gallery, slider or lightbox. 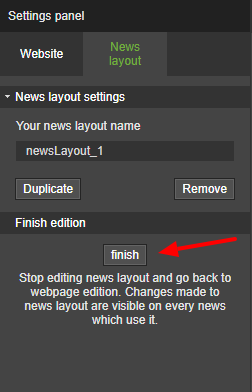 Edit a newsfeed template or create a new one. Add to the template a gallery, slider or lightbox. You can add any number of these elements. To every gallery, slider, and lightbox you can upload some exemplary images. They will be displayed in every newsfeed made with this template. Add a new newsfeed with the previously created template. Add images to the gallery, slider or lightbox. Whenever you make a new newsfeed, in each gallery, lightbox, and slider will be placed images you uploaded in the newsfeed template. Change them now to images that suit your newsfeed best. Keep in mind that they will be changed only on this particular newsfeed.